The batch of Ts I got from Roaddog. As he stated... a package I couldn't resist. Some real beauties in this bunch. may be in need of a molt. Sweet, and a voracious eater! Update 5-4-11 - Devarna is a mature male. :-( Hoping to send him off for breeding. Burning, the suntiger (P irminia) ventral view. 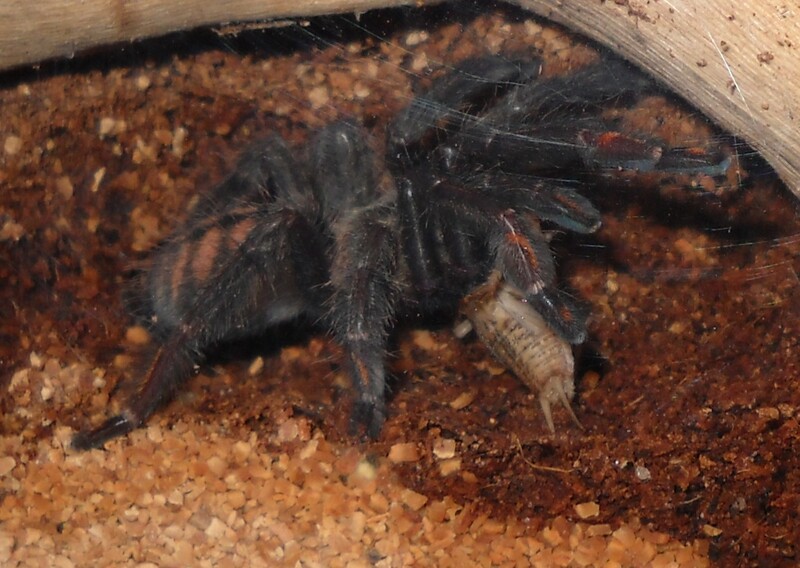 Bright, the second Suntiger (P irminia) having a big lunch. 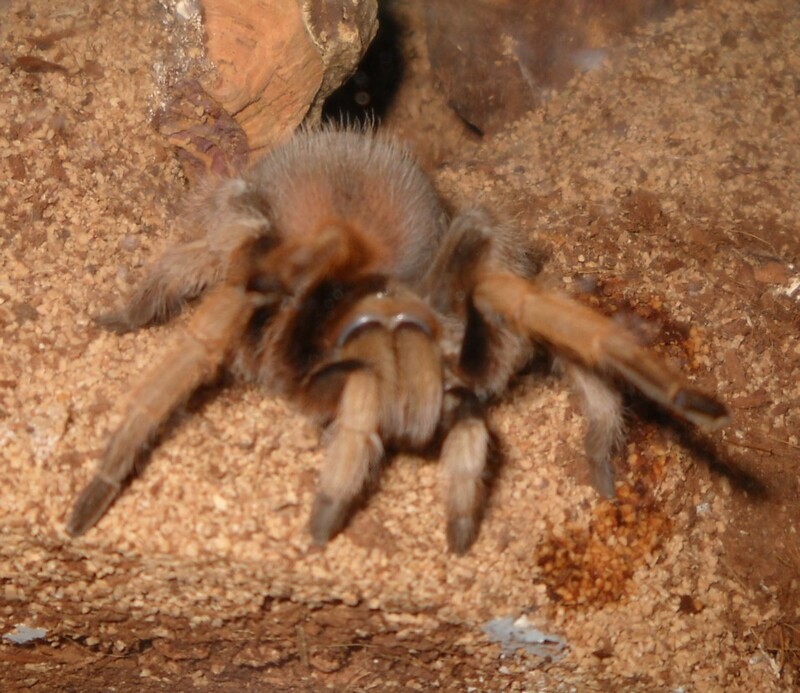 Sallah, a little B smithi (Mexican Red Knee). (Don't worry, the tape is on the OUTSIDE of the tank). Just beginning to show adult coloration. She (?) is about 1.5" legspan. Piel Azul, a Pichigangui Blue Beauty. Tiny, probably only 2nd instar. Waiting to see if he/it will eat the pinheads I gave it. 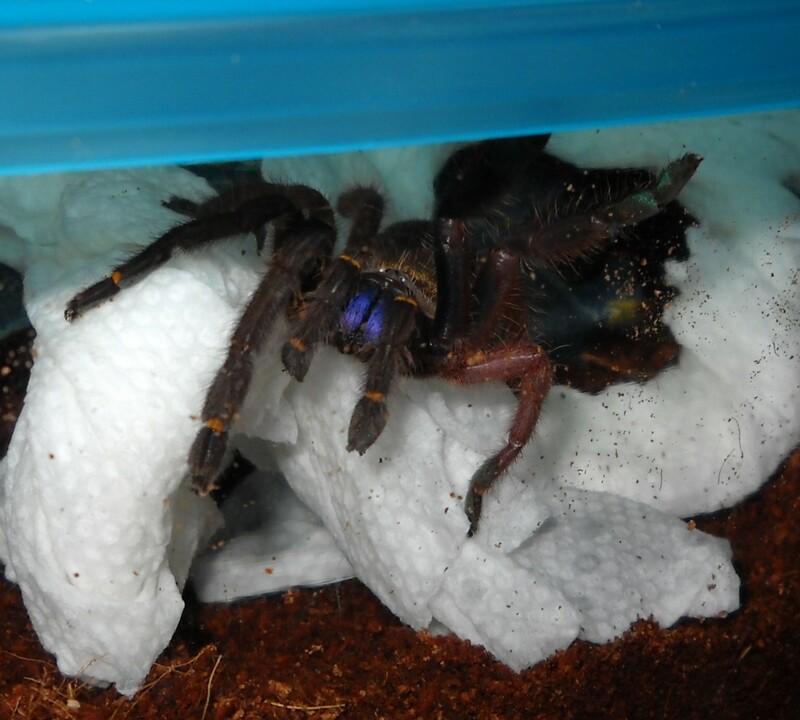 Piel Azul in his hide - the vial he shipped in. Yes, tiny, tiny! Legspan wise, smaller than a dime. Update Feb, 2011. 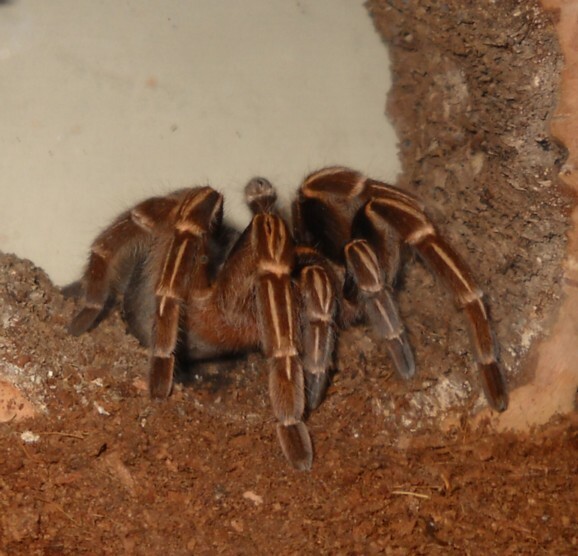 Piel has molted several times, is aobu 1 1/4" DSL... I love this little spider!!! 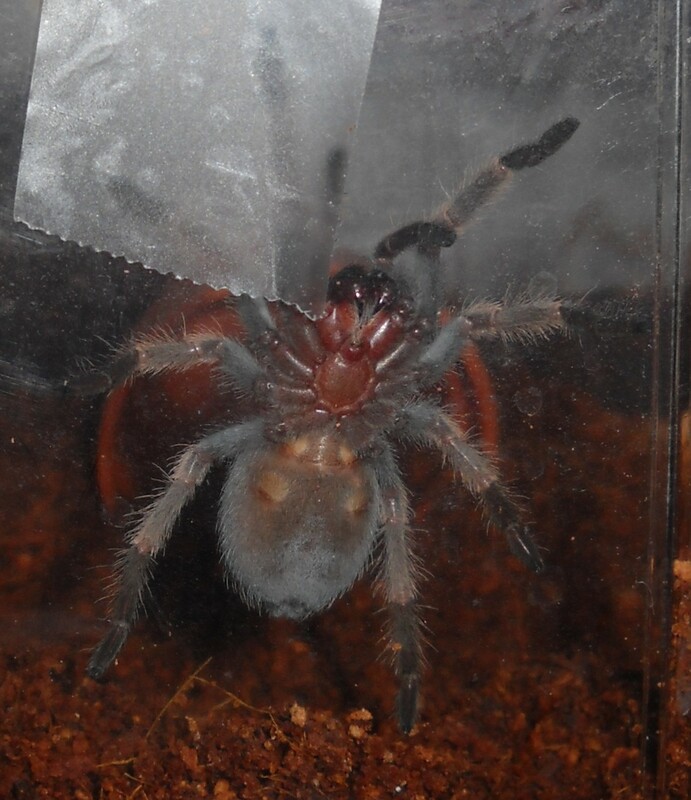 Rizzo, ventral Shot. 0.0.1 (any guesses?) 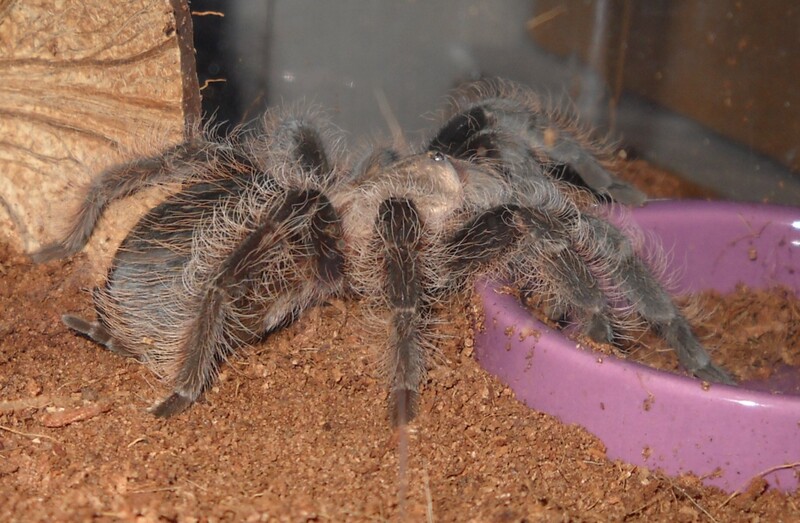 Honduran Curly Hair (Brachypelma albopilosum). Rizzo set about right away to rearrange her home. 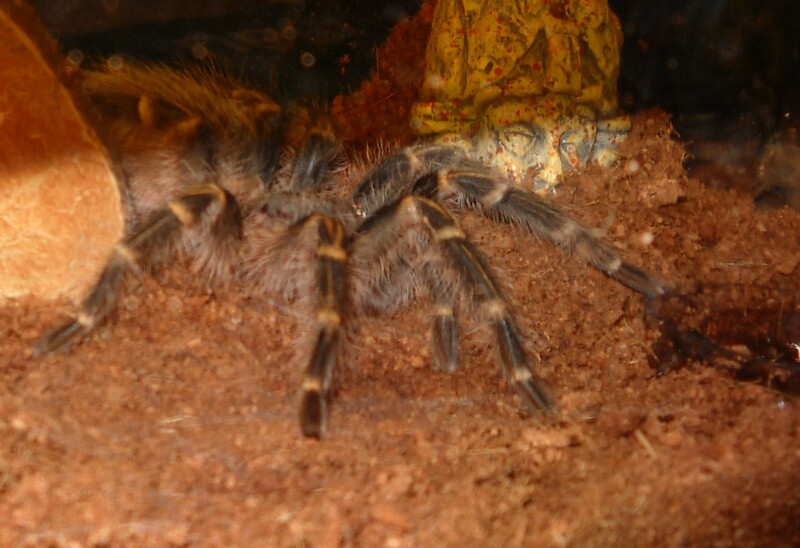 Actually managed to photograph her moving clumps of substrate. Watched Pernambuco do this also. 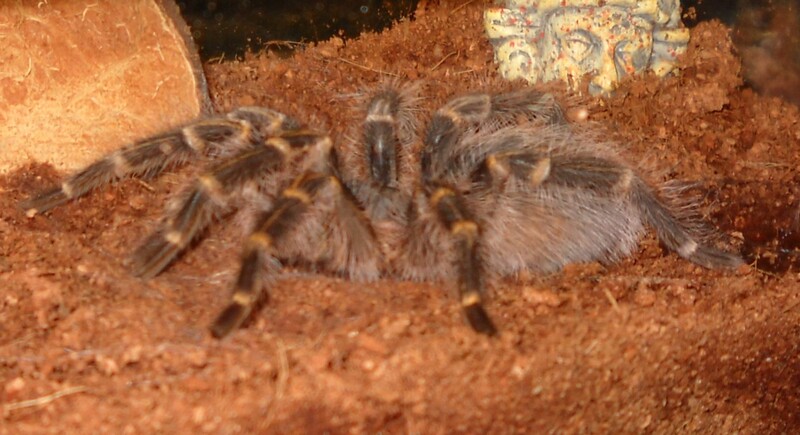 They ball the stuff up with palps, fangs and forelegs, then web it into a clump. They they pick it up and move it where they want it. Amazing to watch in the daylight. Quite the Queen of the Collection (don't tell Mae West...). 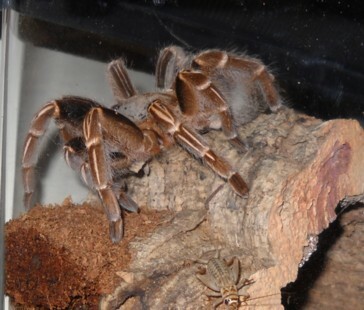 HRM Victoria, as S. rubronitens - Panama Red Rump. A huge (6+") Beauty. She was most unhappy about being shipped and wanted out of that quart deli cup RIGHT THEN. She told me about it the whole time, while I struggled to get the tape off so it would not accidentally touch her. She likes her hide though, and spends time lounging in it. She also seems to have a decent appetite. She is not a handle-able spider. I did have to pick her poor, cold self up during the Freeze. She weighs a couple of ounces. 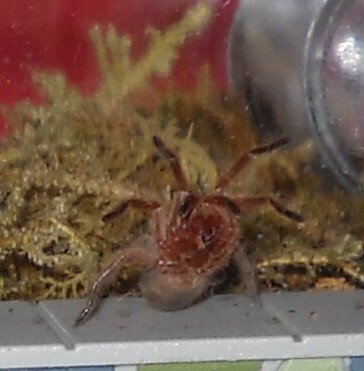 She is NOT a small spider, with a DSL of about 6-6.5". She may or not be gravid. I keep waiting. Meanwhile, post-Freeze, she is face-in, in her cup/hide, and will not come out. 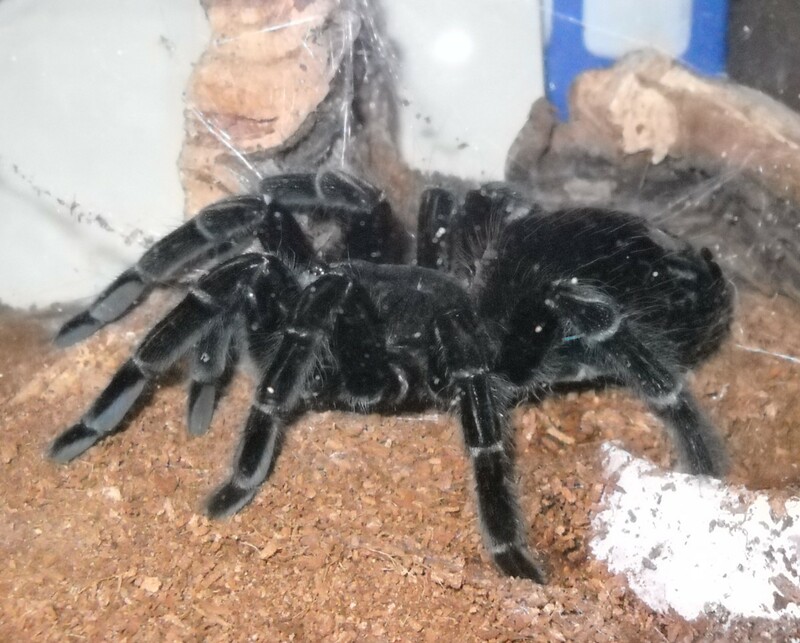 Update - Victoria laid her eggsac 4-11-11. May have to start a separate page. 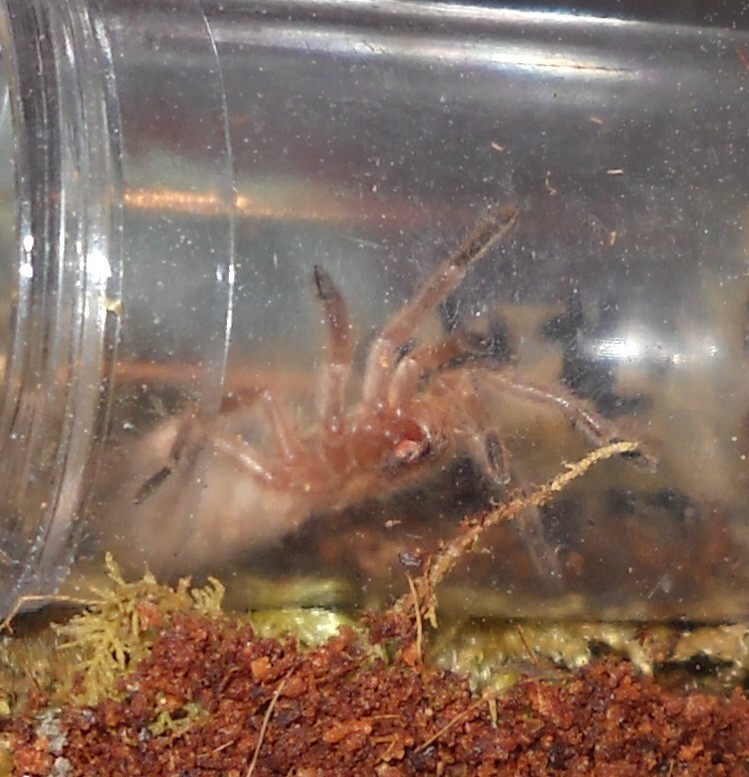 Fingers crossed for a viable sac and eggs-with-legs! D'ogeron, the P. cancerides (Haitian brown) was lost during the Freeze of January. Scrunchie, (A seemani) a Costa Rican Zebra. Nice big female, about 4.5-5" legpan. Not sure about her "personality" yet. 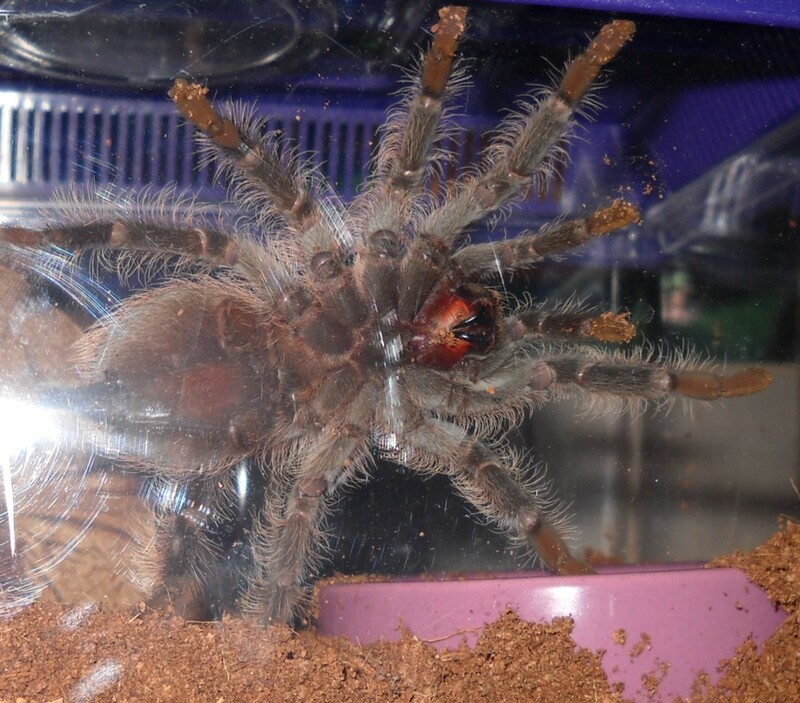 Aritza is a lovely chalcodes. While she spends time in her burrow, she often comes out to sit and be looked at.